Transformation and change are often thought of as long and tiring processes; this thought, in turn, acts as an obstacle to starting. However, at the Ramp Up Your Run Clinic, we will teach you how to transform yourself one step at a time, making small but impactful improve­ments that inspire you to continue. All of what you will learn can be eas­ily brought into your busy daily routine and will help you to better balance your lifestyle and health. Usually the best ideas are the simple ones that pay attention to the small details. These small details may seem trivial and a waste of time; however, they are the stepping stones to pro­gress. Legendary basketball coach John Wooden, who led the UCLA Bruins to 10 NCAA championships, would get his players to practise putting on their socks for the first two weeks of each season. The reason was quite simple: any wrinkles in the sock could lead to blisters. A blister meant his players were not bringing the best versions of themselves to practice; it could even mean missing practice altogether. One of the smallest details that we share with people at the clinic is how to walk with a book on their head. This teaches optimal posture for human movement and is the first simple step to running like a predator. 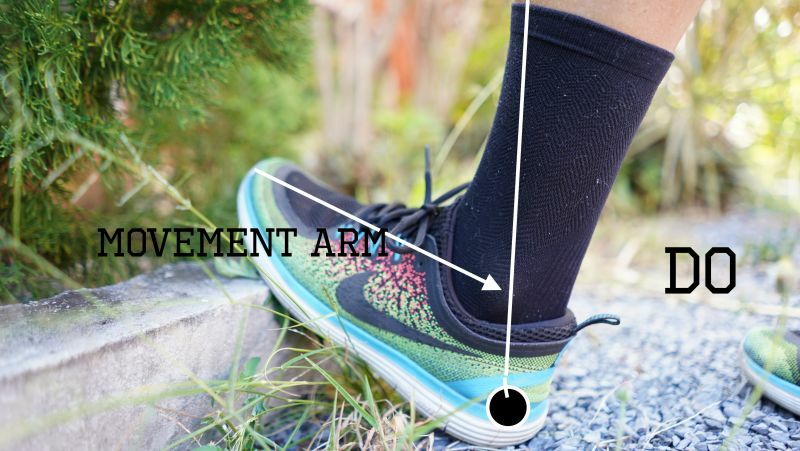 When doing a gastrocnemius (calf) stretch, the pivot point should be the heel and not the mid-foot. This 15cm will change the movement arm and its effect on the ankle joint. 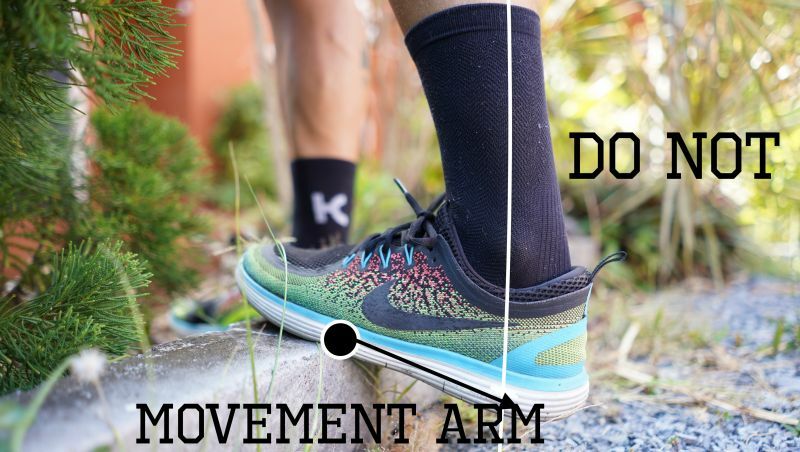 The movement arm and pivot point at mid-foot will cause an eccentric (lengthening) con­traction on the gastrocnemius muscle. You will feel the traditional heel drop because the muscle is contracting eccen­trically. If we want to stretch a muscle, it can’t be contracting. The gastrocnemius crosses the ankle and the knee. If the gastrocnemius is chronically shortened from the inher­ent nature of running and lifestyle, this will cause a slight bend in knee, “turn­ing on” the quadricep muscle (thigh muscle). This could result in tension pulling the patella (knee cap) upwards. This tension will force the patella into the joint space which can lead to increased friction and possible inflam­mation. Fifteen centimetres might not seem like a big deal when running 10km or 21km, but when it comes to peak performance, they can make all the dif­ference. One of the most difficult steps is the first one. There are times when I’m not bolting out the door to chase the health benefits associated with running. It can be a grind at times to get out and take that first step. The solitude of the road doesn’t make for the best running part­ner at times either. It’s important not to wait for the ‘right’ feelings or the ‘right’ timing. They are never going to ignite you to start, and the timing is never going to be ‘right’. Action is more powerful than lack of confidence or not having the ‘right’ feelings. Transformation happens. Footfall after footfall you realise that you have picked up momentum and you will fin­ish the run with a bigger smile then when you started. Entry to the Ramp Up Your Run Clinic includes: a dynamic better run­ning technique training session; a 10-week step-by-step training guide for either the 10km or half marathon; healthy, nutritious, post-training meal and lunch; a strong running and lifestyle postural foundation; injury prevention; healthy nutrition; running-specific strength training; mindset training; and instant access to support and accountability. 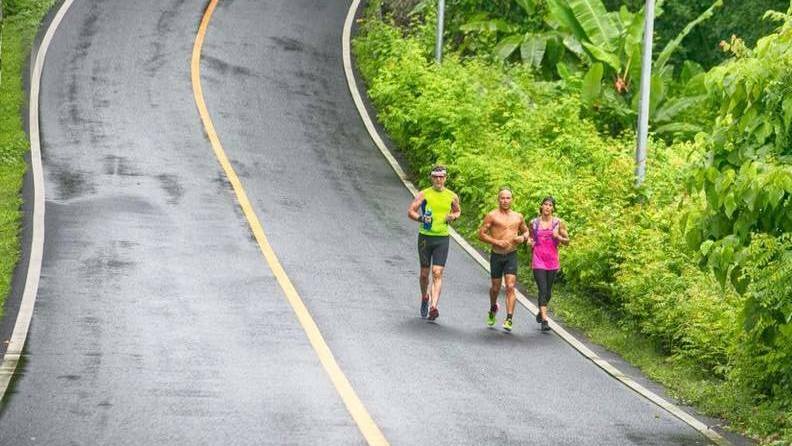 The Ramp Up Your Run Clinic takes place on Saturday, March 23, from 7am-1pm at Phuket Boat Lagoon. Tickets are available here. The closing date for tickets is Thursday, March 21.